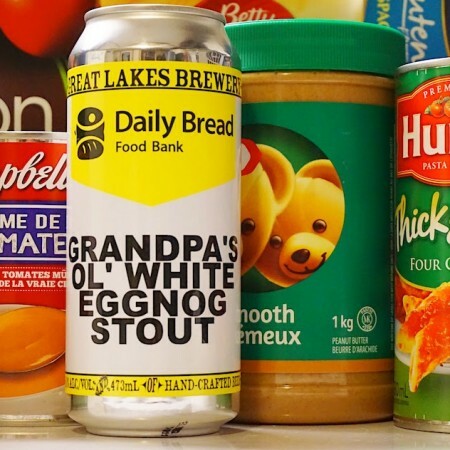 TORONTO, ON – Great Lakes Brewery has announced details of the 2018 edition of Hops For Hunger, the brewery’s 10th annual campaign to raise donations for the Daily Bread Food Bank. For this year’s fundraising promotion, GLB has brewed a batch of winter seasonal Grandpa’s Ol’ White Eggnog Stout (5% abv) that has been branded especially for the campaign, with $1 from each can and glass sold in the brewery retail store and taproom set to be donated to Daily Bread. Customers are also encouraged to donate non-perishable food items, diapers and baby food to Daily Bread by dropping them off in the yellow bin located in the store. Those who donate will receive a complimentary 5 oz beer sample in the taproom. For more details, see the full announcement on the Great Lakes Brewery website.